Seven years ago, we took a trip. And seven years ago, I wrote a letter. Here it is, again, for all to read. This was the trip where a muse touched me on the shoulder and I first told Charlotte Jennie that she was a caterpillar and that she would soon become a beautiful butterfly and fly away from us. 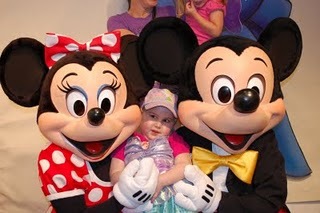 Remembering our Make-A-Wish trip alternately lifts me up and tears my guts out but remembering the magic of it all helps keep me connected to Charlotte’s memory. I’m sure you receive letters like this frequently enough that you don’t really need me to write you another one but it is very important to us that you know about our trip and the events leading up to it. On January 20, 2009, while Barack Obama was taking the oath of office, I was in a hospital emergency room with my then 3-year old daughter Charlotte Jennie learning that she had a very large tumor in her brain. We were admitted to MCV in Richmond, VA that day, she had a full MRI the next morning, and had her first of four brain surgeries on Thursday, Jan. 22. We have chronicled our experience on www.CJSTUF.org so I won’t go into too much excruciating detail about that. In the spring, we were approved for a Make-A-Wish trip. When asked what she would do if she could do anything in the world, she answered, “Go where the princesses are.” (Meaning Disney World, of course). We were planning to go possibly after the first of the year, after the majority of her current treatments were finished; but in November we learned the worst. After all the surgeries, chemo, and radiation, the tumor was still growing. And it had moved to the brainstem. We were out of medical options and it was the opinion of our medical team that we needed to think in terms of weeks and not months. The main goal in all of our lives was refocused to getting Charlotte to Disney World as soon as possible while she could still enjoy it. We contacted our local MAW chapter and they got on it, securing us a week at Give Kids The World Village Starting Dec. 1. We arrived, safe and sound, and headed off to the Magic Kingdom the next day (Wednesday, Dec. 2). We were told the Disney staff would offer extra help to MAW families. We had no idea how deep Disney’s commitment to MAW would be. We were ushered to the front of lines all day and given preferential treatment everywhere we went. Characters went out of their way to visit with us and cast members seemed to seek us out to ask if we needed anything. We felt very well cared for. Topping the list of amazing events for us were the character visits with Mickey and Minnie and then with the Fairies Silvermist, Tinkerbell, and Rosetta. We arrived at the area to see Mickey and Minnie in the morning and toured both of their houses first. When we walked into the “barn,” it was almost an accident. This was our first experience with bypassing the long lines and we couldn’t believe it when we were actually walking into the room with Mickey and Minnie after waiting less than 10 minutes. The visit was wonderful and both Mickey and Minnie conveyed to us, even without words, the care and concern they felt for us with extra long hugs for Mommy and Daddy from Minnie and multiple extra firm handshakes from Mickey as if he was trying to let us know through the glove how much he sympathized. Charlotte was doted upon and given more time to be with them than I ever thought would be possible. We walked out on a cloud. Not thinking we could top that for the entire trip (and it was the FIRST thing we did on the FIRST day there), we headed up to see what there was further in the park. We eventually found ourselves at the Fairies and Princesses venue and since we were having lunch at Cinderella’s Castle (generously donated by a friend), we decided to see the Fairies. The sign for wait times was set at 45-min but we got to go in the “other” way, which had us waiting about ten. The following events are etched into our brains forever and we will keep them close for as long as we live. As we neared the room where the fairies were waiting, we got Charlotte out of her chair and had her walk in. I held her hand as she was rather unsteady. She was greeted by Silvermist, who took her other hand and began to lead her over to a large flower to discuss the color similarities between the petals and CJ’s pink tutu. As Silvermist took her hand, Charlotte immediately let go of mine and totally forgot about us. It was as if she and Silvermist were best friends from long ago. It was truly magical! We had a video camera but seeing CJ so incredibly happy after all she had to endure made us completely forget to tape anything! It’s ok. We got lots of photos. We just watched and cried as Silvermist called Tinkerbell and Rosetta over to discuss matters of great import like what talent Charlotte might have. I believe they decided she had multiple talents. 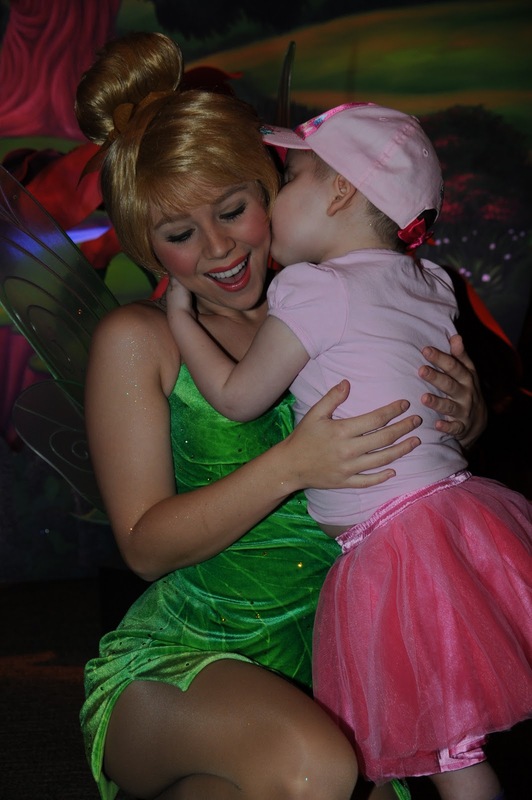 Tinkerbell was Charlotte’s absolute favorite and they got to spend a lot of time together. CJ told her about all the other fairies and what they all did. All three fairies were so amazingly attentive and gentle with her. All the while we never felt hurried or pushed into leaving. Charlotte got to spend as much time as she wanted with them and when we finally left, we knew we had experienced something very special. It wasn’t even noon yet. Did I mention this was the first day? The next major thing was lunch at Cinderella’s Castle after a quick visit with Ariel (CJ’s absolute favorite princess!) in her grotto. I think I was looking forward to the lunch as much as anyone. When we walked in, Cinderella was greeting people in the front room and, of course, we were ushered right up to her. Charlotte had a wonderful visit with her and soon after, we were called up for our table. This was another wonderful experience. The princesses all came in and made the rounds and CJ was in heaven! One humorous part was that when Belle (another of Charlotte’s favorites) came around, it was the exact moment the food arrived. CJ was very hungry and that hotdog was calling to her but at the same time, here was Belle! I’m sorry to say Belle didn’t get nearly the reception she would have normally received. By the way, the food was divine! CJ crashed after that and we headed back to GKTW for the rest of the day. Day 2: (Thursday, Dec 3) We basically retraced our steps and did the exact same thing in the morning. Some cousins who came up from South Florida joined us. We toured Mickey and Minnie’s houses and got to see them again. This time we were in a different room but with the same results. They were wonderful again. Mickey pulled out a new trick and made his nose wiggle which CJ found very amusing. Again with the long visit and the extra care and everything. Oy! It was great. The wait for the fairies was over an hour this time. We only waited 10 minutes again. Mommy was also ready with the video camera and it was rolling when Charlotte walked in. We were greeted by the same Rosetta who was there the day before. The first word out of Rosetta’s mouth was, “Charlotte!” The fact that she remembered CJ and the things they had talked about took our breath away. Again, it was like old friends getting together. It was another magical visit and this time Rosetta got the lion’s share of Charlotte’s attention. They were nuzzling forehead to forehead and talking quietly about the things the fairies and princesses do. I felt such a strong sense of affection between CJ and all the fairies and I can only think that they show the same to all the guests who come through. Later in the trip, we went to Animal Kingdom and got to see Finding Nemo, The Musical. Charlotte was very tired and had been just lounging in her chair for most of the morning but as soon as the performance began, she was attentive, alert and watched the whole thing sitting up on my lap. We all particularly loved the bit with the penguins! It was very funny and penguins were CJ’s favorite birds. One last item of note was when we went to Rafiki’s after the safari. Rafiki was greeting kids when we rolled in and his assistant told us he was just getting ready to go on break, which was fine since there weren’t that many people around and we had just arrived. We figured we’d talk to him when he came back out. Well, he caught sight of us and made a bee-line for Charlotte. I don’t think he got much of a break that time. It is a testament to the talent and training of all the cast members that we had such an amazing trip. I sincerely hope they know that their job means much more to people like us than they could ever possibly imagine. It is evident even in the elderly street sweeper I met outside the bathrooms who showed me his very efficient technique for scooping up little bits of things. It was kind of cool and it stuck with me enough for me to mention here. Charlotte Jennie Reynolds passed on Thursday, January 7, 2010 at home surrounded by stories, music, and love. It was a beautiful passing and Disney was a part of it. I can’t imagine that this letter might make its way to the specific cast members with whom we came into contact but if so, please let them know that they have touched our lives and become permanent pieces or our memories forever. I’m sure they do it everyday and yet might not realize their impact.